Providing Colorado Event Organizations with digital marketing services and Advertising Promotionals. Colorado Promotion provides professional digital marketing services and advertising promos for Colorado Events and Colorado based Event Organizations. At Colorado Promotion, we develop each event marketing relationship into a unique, locally Colorado community focused endeavor. Truly, no two events are alike, so we strive to advertise your Colorado happening in the marketing niche where festivals, expos, conventions, and local gatherings thrive. Beyond website design. 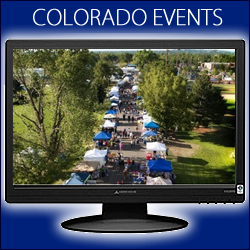 – Colorado Promotion can help your event marketing efforts at any point along your advertising journey. From initial website design, to unique web and social media ad opportunities, find out how we can promote your Colorado venture. Contact Us.